The case is hand crafted with reinforcing inserts for extra structural integrity, strength and durability. The acrylic face is lightweight and durable. The back has easily removable fasteners that allow for convenient placement of your standard 3 ft. x 5 ft. flag. 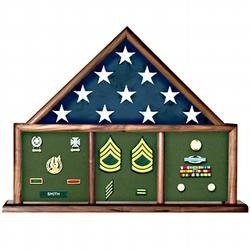 This solid wood case has three bays for medals or rank insignia. The middle bay has an optional forward position for a plaque, or the three bays may be on an equal plane for larger objects. The background fabric is actual service uniform fabric available in: Air Force blue, Army green, Coast Guard blue, Marine Corps blue, Marine Corps Green, and Navy blue. We also offer velvet background material available in: black, navy blue, red, and maroon. The case is finished with a high-gloss varnish that treats and protects the wood, ensuring a lasting luster. It can be easily cleaned with a damp cloth. Complete care instructions are provided, including instructions for proper folding of your special flag. Flag is not included. Allow 4 - 6 weeks for delivery. Orders for the American 3 bay flag case are usually shipped out within one business day to places within the USA and Canada.